As I noted in my previous post, the very big government budget deficit in 2010 was largely the result of the recession. That fact is difficult to square with the myth that the coalition government rescued the economy from an impending financial crisis, so it is important to push another explanation for the large deficit: that it reflected the profligacy of the previous government. The only way you can sustain the myth that Labour was fiscally profligate is by suggesting that immediately before the recession the UK was experiencing a massive boom. In an economic boom tax receipts are high and spending on transfers low, so the budget should be in surplus. If it is in fact in significant deficit, that indicates serious fiscal laxity. The first point is to stop talking about GDP, and start talking about GDP per head ... As the chart shows, we have failed as yet to make up for any of the ground lost not just in the 2009 recession, but also ground lost as a result of fiscal austerity in 2010 and 2011 … So we have not really seen a recovery. Maybe the pessimists are right, and we will never recover any of that lost output, but still you do not call it a recovery. I can put it another way. Quarterly growth in GDP per head since the beginning of 2013 has averaged about 2% at an annual rate. That is below the average growth rate since 1955. A recovery from a deep recession would have growth rates well above the long term average … the prosperity of the average citizen in this country has hardly increased over the period of this coalition government - a result that is totally unprecedented since at least WWII. As recoveries from recessions go, this does not seem like a recovery worthy of the name. Yet we keep being told by mediamacro that the Coalition’s strong card is its economic record! 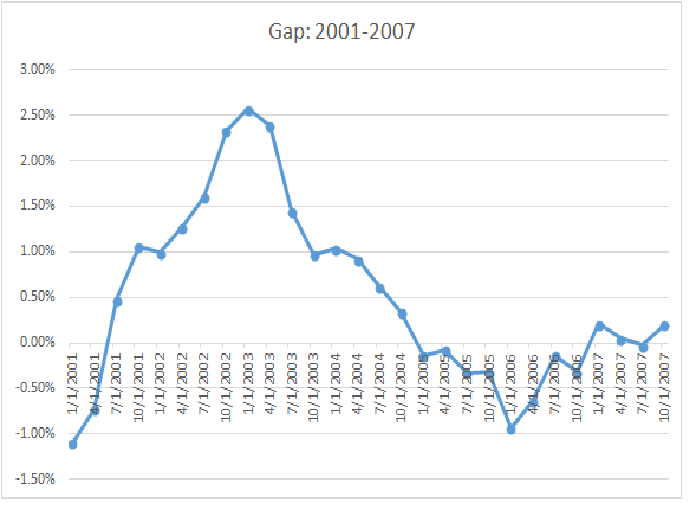 Chart 3 shows estimates of our old friend the cyclically adjusted primary balance since 2009. I’ve included three sources – the IMF, the OECD, and Britain’s own Office of Budget Responsibility – just in case someone wants to argue that any one of these sources is biased. In fact, every one tells the same story: big spending cuts and a large tax rise between 2009 and 2011, not much change thereafter. the Fed has returned to its discretionary, unpredictable ways, and the results are not good. Starting in 2003-05, it held interest rates too low for too long and thereby encouraged excessive risk-taking and the housing boom. 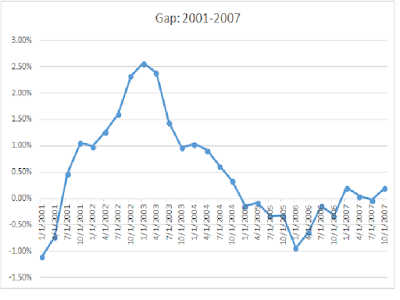 There are multiple measures of the output gap that show the U.S. economy overheating during this time. 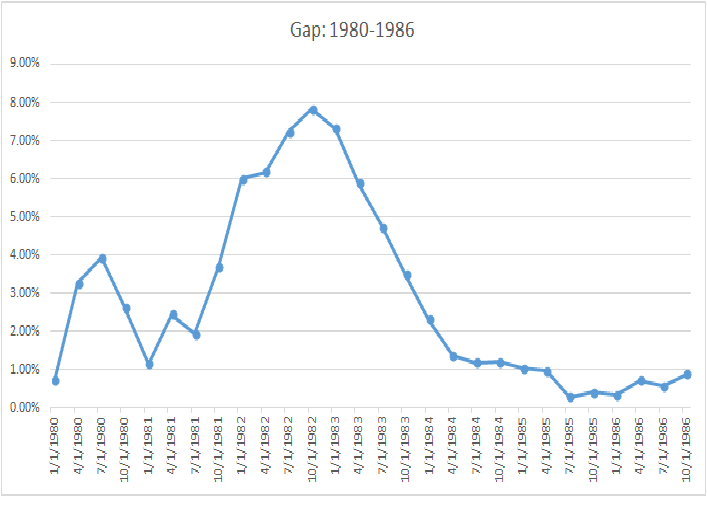 Below is a figure from this article that compares the real-time and final measures of the U.S. output gap. Everyone shows ex-post an overheating economy during the housing boom. In this article, the author reviews the continuing controversy over the Reagan tax cut. Republicans often assert that it was so expansionary that there was no revenue loss, something the Reagan administration itself never claimed. The truth is that the tax cut lost a lot of revenue, but helped the economy transition from high inflation to low inflation at an unexpectedly low economic cost. Keynesians came into the Volcker disinflation — yes, it was mainly the Fed’s doing, not Reagan’s — with a standard, indeed textbook, model of what should happen. And events matched their expectations almost precisely. 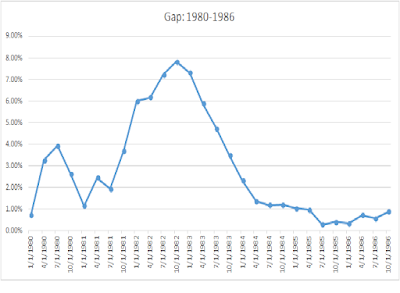 Using the CBO measure of potential GDP during the 1980’s, the Volcker disinflation involved what Paul calls a PLOG – a prolonged large output gap.